Let me first clarify that I adore Breath of the Wild’s boundless world. I thrive in environments free of hand-holding, as my curiosity is my best, most entertaining guide. Breath of the Wild’s beautiful environments had me enthralled from the moment I set foot in them. However, I also ironically appreciate some limitations in open world settings. I enjoy stumbling across a dungeon or an enemy that I can’t yet access or beat until I return with a stronger character. This is why I often felt myself pining for more challenging barriers in Breath of the Wild – ones that would compel me to come back more prepared before refacing a challenge. Aside from Lynels and Hyrule Castle, there are very few instances where you’re driven to do so. This feeling fully struck me when I faced the Thundra Plateau. Tingle’s Maps is a series in which we explore the endless lands of Hyrule in search of our favorite places in The Legend of Zelda. We’ll explore everywhere: the beautiful landscapes that make us put down the controller in awe; the deadly terrain that threatens Link with the harshest of elements; the bustling towns that bring the game to life; and the abandoned grounds that evoke peace and sadness. As well as the grand locales, we’ll also discover all the secret caves and hidden crevices that lie between. Let’s adventure! 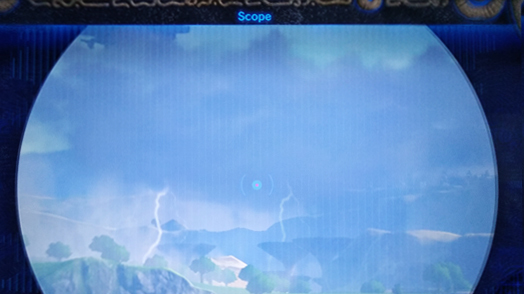 From the moment I acquired the Sheikah Slate’s Scope feature, I was eagerly scanning every inch of the distant horizons across Hyrule. That opening scene of Link running up to the cliff and taking in the vast, open world tantalized my exploration taste buds – I had to know what was out there waiting for me. All sorts of interesting destinations caught my eye, including the iconic Death Mountain and what I’d later discover was one of the Divine Beasts flying above Rito Village. But I was particularly intrigued by a valley of strange, mushroom-shaped trees, veiled by a huge cloud of thunder, lightning, and rain: the Thundra Plateau. My imagination thought hard about what this strange place could have in store for me. I became excited by the idea that it was only accessible if you’d acquired a way to navigate through a lightning storm unscathed. 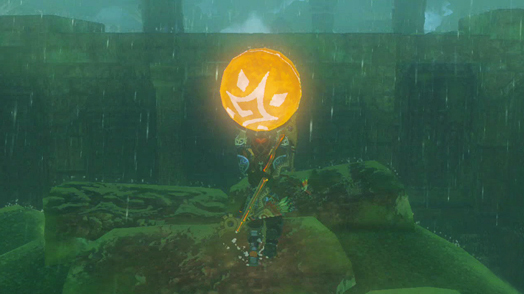 I actually had no idea the Thunder Helm was a thing at this point – I just figured in traditional Zelda fashion I needed a certain item before attempting to go there. Plus, lightning posed a significant threat during exploration in general, so I figured this had to be the case. I wouldn’t reach the Thundra Plateau for a while, but I frequently admired it through the Sheikah Slate Scope. I couldn’t wait to go there and explore this lightning-filled forest. I pondered about what it would look like, what sort of puzzles I would face, and most importantly what I had to do to explore it safely. Fast forward thirty or so gameplay hours later to when I acquired the Thunder Helm. It was finally that ‘aha!’ moment I’d been waiting for. “This must be it!” I thought. “I can finally go to that unusual area!” I was headed in that direction anyhow since I had yet to find Rito Village. I couldn’t wait. When I reached the Thundra Plateau, I quickly realized that this isolated storm didn’t cover as much ground as I originally thought. In fact, it was nothing to do with the area at all – it was a shrine trial. Despite my surprise, this was a welcome change for a shrine. It reminded me of the shrine hidden on the island filled with permanent darkness and those in labyrinths, which were also nice changes. Forgetting for a moment about the lightning forest I’d pictured in my imagination, I equipped the Thunder Helm and faced the Trial of Thunder. Honestly, it was a great puzzle that I wish Breath of the Wild had more of. Moving those balls into the correct places took a lot of creative Statis hitting and limited wall climbing, all while enduring a heavy thunderstorm. It was intense yet entertaining. Once the clouds parted and the dust settled around the Plateau, I remembered what I’d envisioned in my mind. I had pictured a dense, difficult-to-navigate forest filled with thunder and rain that doomed anyone who entered without the Thunder Helm. What I’d just faced was fun, but it had no restrictions as I’d imagined. Nothing was stopping me from arriving here thirty hours earlier and simply unequipping all my metal weapons to complete the puzzle safely. It was then that the feeling struck me: nothing is off limits at any time in this game. This was simultaneously appealing yet disappointing. The simple joy of exploring the vast world and its diverse landscapes was exactly why I was loving this game, but I was also longing for a sense of progression. I was craving those moments where your exploration rewards you with access to somewhere previously off limits. I loved the ability to go anywhere I pleased at any time, but if there had been certain dungeons or enemies here and there that I had to come back to later, I would have loved the world even more. It would have given it more depth. Despite all that, the shrine on Thundra Plateau remains one of my favorites; but I will never forget that dampening feeling. It now has me hoping that the next Zelda installment brings back a little bit of linearity, as well as Link’s variety of weapons and items. Nothing quite beats the feeling of finding a ‘key’ that fits perfectly into a lock you’ve been desperately wanting to open for a long time. I hope we can feel that more in the future.